A fan of my blog, Virginia Carstarphen, is the owner of Trader Todd's and she graciously sent me one of her bar's tee-shirts. 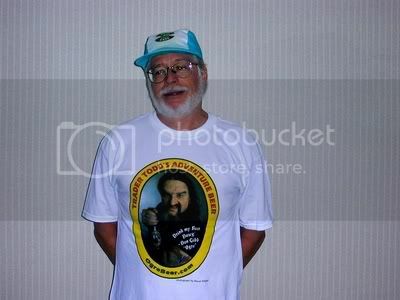 I guess if I met this guy I would drink whatever he gave me. Thanks for the tee-shirt Virginia, I will wear it with pride. If you are ever in Chicago be sure to stop into Trader Todd's, it is the only place where you can get Trader Todd beer on draft. It looked to be a hot weekend and I was lucky enough to have an invitation to spend it with friends of mine in Long Beach, the one in Long Island, New York, not the one in California. On the way from the train station to my friends house I stopped into the following three bars. A fancy restaurant and bar located on the main drag at 20 West Park Avenue. It has a good-sized marble topped dark wooden bar with a black foot rail. 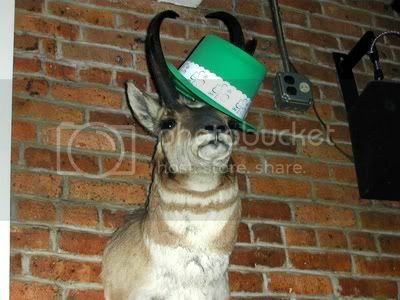 The bartender made me remove her cap from the bar saying it was bad luck. She also said that if she ever wore a cap behind the bar and walked past the cash register while wearing it she would have to buy everyone a drink. Needless to say I tried to get her to put on my cap so I could take a picture, but she refused. Hey, it was worth a shot. The back to the bar was very ornate with carved busts of women similar to what you might find on the front of a sailing vessel. Kind of appropriate for a place with a definite nautical theme. There are two large built in mirrors with glass shelves for the liquors. The center area is exposed brick and a large mirror with an elaborately detailed gold frame. A vase with calla lilies (the Mysterious Chinese Woman told me what they were) sat in front of the mirror. They were quite aromatic. There is a large plasma television set at each end of the bar. There are a couple of very large pinkish alabaster looking light fixtures and several more older style fixtures with squished glob bottoms and eight smaller lights above. There is both an upstairs and a downstairs dining area. The downstairs dining area is separated from the bar by a fancy glass topped partition with a ledge for drinks. Columns along the partition also sport large bouquets of flowers. Overhead fans hang from the yellowish tiled ceiling. As I mentioned, the place has a nice, comfortable nautical look to it and the downstairs dining area has a nice fireplace with a large mirror on top. There are also numerous pictures of old Long Beach and sailing vessels on the brick walls. Had a nice time chatting with the bartender and an elderly gentleman who reminisced about the old days in Long Beach, zoot suits, and beers for a dime. Ah yes, the good old days. I had a Sam Adams Summer Ale. Just down the street a bit at 124 West Park Avenue is this large restaurant that has a brick bar with a black marble top and a black wooden foot rest. There are four televisions above both sides of the rectangular bar and several more scattered around makes this a pretty decent sports bar. There are cute little stained glass shaded lights hanging over the bar. They cultivate a bit of a library look with lots of books on display on shelves and in book cases. I guess this is appropriate because it occupies the bottom floor of the old Long Beach library. There is a separate dining area with brick walls and skylights that makes for a pleasant, airy look. The walls are paneled to about waist height and light yellow above. The wall separating the dining area from the bar area is a series of French doors. The window facing the street has drawn drapes and two tables that makes it seem as though you would be dining in someone’s private library. A few guys at the bar were talking to the bartender about what I thought were their black-outs. My initial reaction was that maybe they should cut down on their drinking a bit. It turned out they were talking about, and drinking shots of, Black Haus, an eighty proof blackberry schnapps. Would be good in a pocket flask at a football game when the weather gets nippy. I had another Sam Adams Summer Ale. 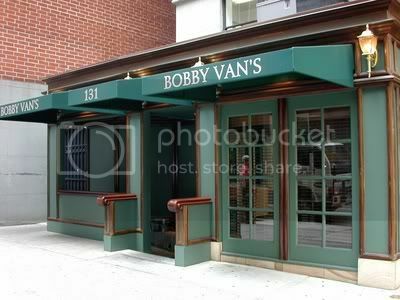 Moving just a bit further to 152 West Park Avenue is this fancy Italian restaurant and bar. The bar itself has a nice black topped bar with a black padded front. The bar chairs are wood with burgundy leather padded seats and cloth patterned cloth backs. Little cone shaped stained glass lights hang over the bar along with large black coiled glass holders. Lots of wine behind the bar with a mirror and a couple of glass shelves holding the liquor. Pictures of old Italy hang on the wall that is covered with wall paper featuring drink recipes. The bartenders were very vivacious and chatty making this a fun place to have a drink. 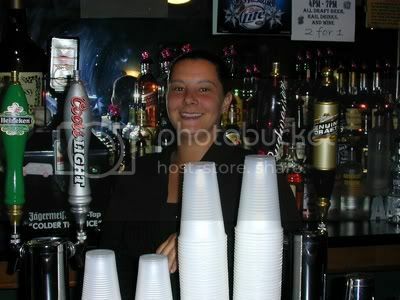 Leah, one of the vivacious bartenders. There are long bench-like tables up front with tan shaded lights hanging over them and smaller tables with plush leather chairs sit next to the glass topped partition separating the dining room from the bar area. Small stained glass windows hang over the tables by the partition. There is a narrow wooden shelf at the top of the partition and a few more bottles of wine sit on top. The dining area is very fancy and light with candles. We stopped by the next night hoping to have dinner there but the wait was an hour and a half so I guess the food must be very good. I had a glass of Tormaresca Italian Chardonnay and headed to my friend’s place. Creeping ever closer to my goal with 587 down and 413 left to go. and then it headed back to Brooklyn. 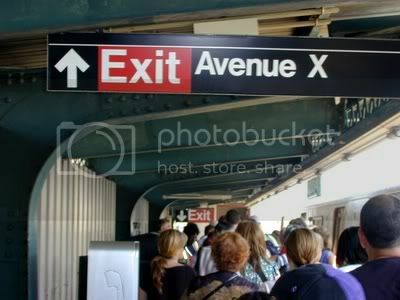 We had to cross over to the other side and catch the train that usually returns to Brooklyn but for some reason was now shuttling back and forth between Avenue X and Coney Island. What a pain. The train was packed and it took about 20 minutes just to go down the stairs, over to the other side, and then up the stairs to the platform. It took about an hour and a half to get to the Beach. Oh well, it wasn’t like I had anything important to do. Oh, wait, I did, didn’t I. 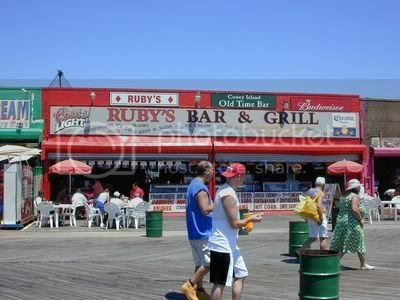 A classic Coney Island boardwalk bar. You have to love the concept of a couple of these bars. I have been to dive bars and I have been to nice beaches, but seldom do you find dive bars built looking out over the beach. This is a deep, dark place even on the brightest of days. The bar is your typical old, well weathered bar along one side of the place. 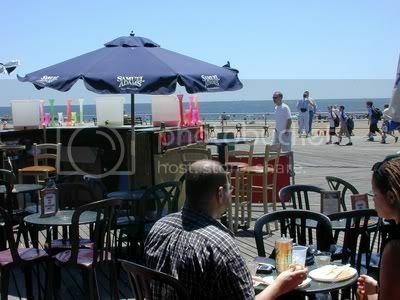 The front area that opens to the beach is largely dominated by displays of fried food and a walk up serving counter. Needless to say the smells permeate the bar and I ended up ordering a corn dog. The Mysterious Chinese Woman was there as well and she had a hot dog. 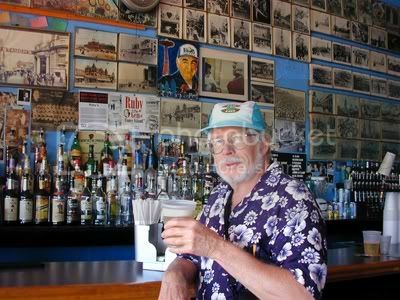 The wall behind the bar is completely covered by pictures of the old Coney Island, although much of Coney Island still looks the same. Certainly Ruby's does. In the back there is a beat up white sofa and table for the lounging crowd. You could probably spend hours just hanging at the bar and looking at the pictures though. 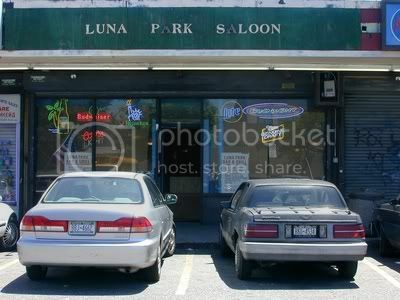 They have a great jukebox and tables and chairs outside. Kind of a perfect combination of sunny day at the beach spent inside of a dark dive bar. I had a Budweiser in a plastic cup. Budweiser just seemed right in a place like this and, quite frankly, the options were limited. They don’t like to sell sodas here because large signs proclaim that a 10 ounce soda costs $4.00. That’s more than the beer. 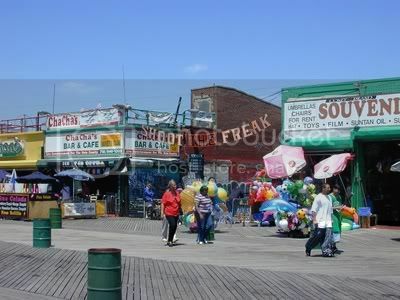 Just a bit down the boardwalk from Ruby’s, and right next to the Shoot The Freak attraction, is a similar looking bar, big, cavernous, all black, and looking out at the beach. Fluorescent plastic glasses hang over the white, tacked on linoleum topped bar. These were probably for the frozen drinks being churned in the three machines behind the bar. There is a large stage area in the back and a set of drums sitting up front. The decaying cement ceiling is black, naturally, and had several bunches of little fish dangling from it. This reinforces the impression that you are in a basement dive bar that miraculously has a marvelous few of the ocean. The bar chairs are typical tubular metal with beat up black vinyl. The walls are covered with what looks to be graffiti as well as photos, paintings, and a display of tee shirts. Overhead fans with green bulbs create a bit of a breeze and a wee bit of light. The friendly bartender, Genevieve, convinced me I should try the house beer, Wild Women & Wise Guys. In a plastic cup, of course. This place is a few blocks off the beach in a little shopping mall that also contains an OTB. Leave your grudges at the door. It has a light wooden bar with a black simulated leather top. It does have a bar rail. There is a string of beer bottle Christmas lights and blue, peeling painted plaster walls. There is a pool table in the back. Five televisions are above the bar, baseball on two of them, A black and white movie on another two, and OTB racing on the third one. There were a couple of guys at the end of the bar with the races showing and the discussion about the horses was quite animated. The bar didn’t sell food but we got there just when the bartender, Adrian, was ordering sandwiches from Pal’s. I couldn’t resist so I had pastrami on rye. The Mysterious Chinese Woman had corned beef. I had a glass of Miller Genuine Draft, and a shot of Jameson’s Irish Whiskey. A nice day with three bars hit making 584 for the year and leaving 416 to go. I decided to take the N train back to Brooklyn. It stops a bit further away from Bar Man’s house but at least it was a straight shot with no transfers. 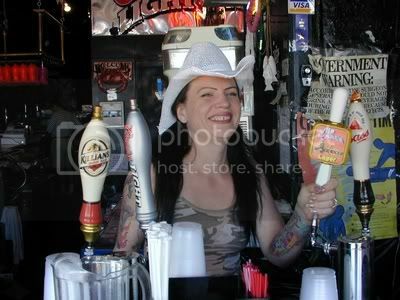 On the way home I passed by Hank’s Saloon and popped in for a quick one. 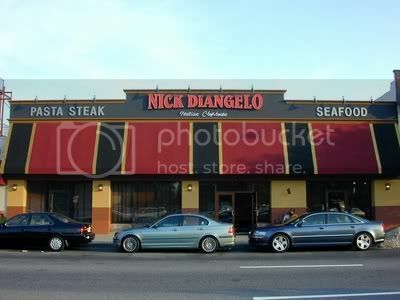 I heard a bit of disturbing news however, it seems that the place has been sold. The bartender, Jeannie, said that after 11 years she may not be around much longer because new people Might be be brought it. She said that she heard the new owner was going to keep it as it is in terms of the décor but build on top of it. We shall see, the place kind of looks like it is already falling down. Anyway, by all means try to get to this place while you can, it may not be around much longer. You can't keep the place the same if Jeannie goes. What a find. 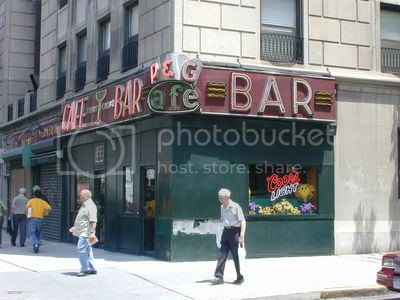 Another classic old bar that you just have to walk out of a subway station to find. It is on the corner of Amsterdam and 73rd, also known as Firefighter Kevin Bacon Corner. Is life great, or what? An old wooden bar with a wood-grained Formica front and a black footrest. Old mirrored cabinets behind the bar topped with stained glass panels. The mirrors are pretty much covered by the liquor bottles sitting on tiered shelves. In the middle is a picture of the bar, similar to mine, that looks like it was taken in the early fifties. As you can see, the bar looks pretty much the same. Dark paneled walls except for the back wall that is covered with a yellowing painting of a European, I presume, castle and surrounding landscape. The current owner’s family bought the place in 1942 but I am not sure how old the place really is. The owner wasn’t too sure either. There is a small dining area separated with a partition that also had a ledge and stools so you could sit and have a drink if the bar was too crowded. The dining area consists of old booths but with light yellow stained glass lighting fixtures. There are also a few plastic fish and a few paintings on the wall back there as well. The place was full of regulars and a beer distributor who was in negotiations with the owner about getting Coors to sponsor some kind of charity event. My favorite part of the conversation was when the distributor was telling the owner about how he had to sneak the beer glasses brought out of the warehouse. Both the owner and I rolled our eyes at that one. 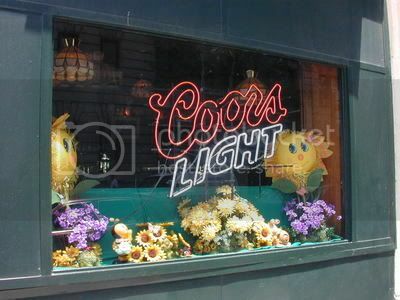 Despite the dive bar look of this place, they did, somewhat incongruously, have large smiling sunflowers in the windows. I had a draft Sam Adam’s Boston Lager. Well, they have a very large selection of beers including such favorites as Goose Island Honker’s Ale and Hitachino Nest from Kiuch, Japan. 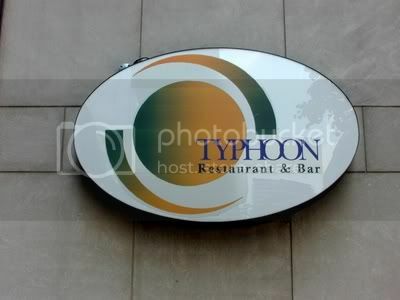 Unfortunately, Westside Brewing Co., at 340 Amsterdam Avenue, has taken the same course as Typhoon and Heartland. They no longer brew on the premises. Typhoon and Westside now both sell a couple of beers brewed by the Chelsea Brewery but the don’t even bother to have them brew to their own specifications and don’t carry any beers with their names. It is Bar Man’s humble opinion that if you no longer brew your own beer on your premises you should not be allowed to have “brewery,” “brewing company,” or anything similar in your name. They do have a nice wooden bar with a brass rail. The bar chairs are wooden with purple patterned cloth seats. Copper helmeted globe lights hang from the brown tin ceiling. Quite elaborate wood cabinets behind the bar hold a large selection of liquor, including an impressive selection of tequilas and bourbons. It is on a corner and has large windows all around topped by stained glass panels. The inside dining area retains an old pub feel to it with wooden tables and chairs. 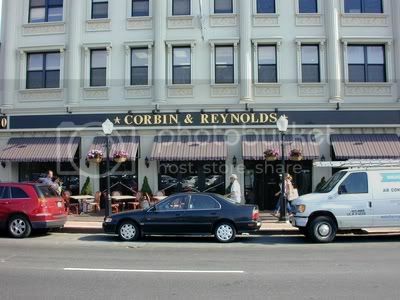 There is also a darker back room dining area and a good-sized sidewalk café replete with planters with flowers. Sometimes a theme just follows me around. Yesterday there were flowers on the bar. 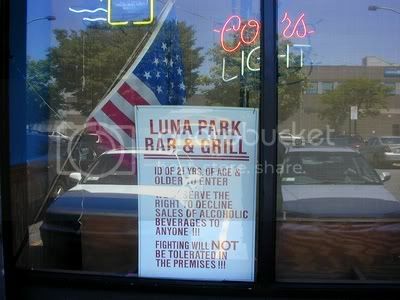 The only negative about this place was a rather unpleasant, well beyond stale, beer odor. And this was despite the door and a window open and a healthy breeze blowing through the place. I had a draft Casa Zilla Monstrously Hoppy Red Ale from the Ithaca Beer Company. See, I told you they had a decent selection of beers. This was a pretty good beer and lived up to its hopped up reputation. The Casa in the name is a truncation of Cascade hops, a favorite of brewers. Hey, if you read this blog long enough you will pick up any amount of trivia. Interestingly, I can find no information about this beer anywhere but I was very careful in copying down the name. Any information would be appreciated. the cat doesn’t usually like people. I think she (the cat) wanted me to buy her a drink, probably a Bailey’s Irish Cream, or a Pousse Café. Bar Man once wrote a paper about career choices and how what you learned in school would apply. I wrote about being a bartender and how the knowledge of the specific gravity of liquid was essential to making a Pousse Café. 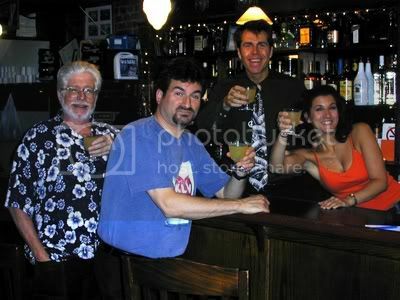 I guess somehow I always knew I would be on one side of a bar or another. This, and I don’t mean to repeat myself, is another classic New York bar, at 349 Amsterdam Avenue, that you should really try to visit before they are gone. They occupy space to valuable to remain so it is just a matter of time until they are gone. Don’t say I didn’t warn you. Anyway, it has an old dark bar with a suitably stick top and a brass rail. There are glass bricks on top of the wooden front to the bar but they are largely hidden by the overhang. There have nine televisions with a few baseball games and tennis playing. This would be one of my recommendations as a place to hang out and watch ballgames. There is a pool table and an industrial sized fan blowing through the place. The ceiling is black and covered mostly with metal beer signs and a couple of Indiana University banners. 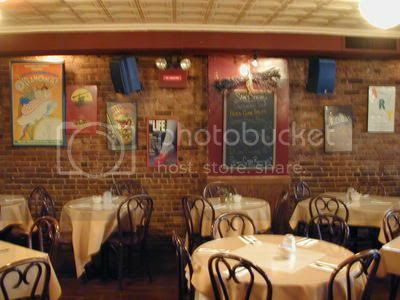 The wall behind the bar chairs is brick and lined with well-worn maroon benches that are high enough that they warrant their own foot rests. The wall above the benches is pretty much covered with beer signs, a large American flag, and a collage of photos of the bar’s regulars. Behind the bar are a couple of ice chests cooling down bottles of beer and fairly plain wooden tiered shelves (looked like something you would make in a grade-school wood working class) holding the liquor selection. These were in front of the requisite mirrors. There was also a small cooler holding Red Bull and above that a sign saying that if you bought a shot of booze you could get a Rheingold beer for a dollar. I wish I had seen it before I ordered. I had a draft Blue Moon Belgian White and because the have Happy Hour almost all day long it only cost $2.50, a real deal. Just next door, is this somewhat eclectic mixture of a place. It bills itself as a Vietnamese Thai restaurant but I had a chilled sake served by a Japanese bartender. Go figure. She was a bit surprised that I pegged her as being Japanese, but Bar Man has had a bit of experience with Asian's of the female persuasion (just ask the Mysterious Chinese Woman). It did have a nice little bar area that gave one the feeling of being somewhat off the beaten track. The bar had a bamboo front and a somewhat gold colored plastic top. The had a few draft beers but nothing interesting. The interior was mostly bamboo with a few fishnets hanging from the ceiling. The flooring was wooden and their were lights covered with woven cones hanging from the ceiling. The back of the bar was kind of a combination of bamboo, mirrors, rattan, and corrugated tin. It sounds a bit weird, but it works. That, coupled with woven coolie style hats hanging on yellow washed walls rally made you feel like you were somewhere other than in Manhattan. Only the glimpses of the traffic on Amsterdam Avenue distracted from the illusion. I had a Otokayma (Man’s Mountain) chilled and straight up. I am really developing a taste for sake. Well not too bad, four bars for the day and 581 for the year leaving 419 to go. I headed home but felt the need for another gargle so stopped back at Keefe’s and had one under the watchful eye of my buddy. You may find this to be amusing. Once again I seem to be linked in the media with Tom Cruise. You will need RealPlayer to see this and you will have to wait until the end of the clip before I actually make an appearance, so go for it if you want to. I had to go back and retrace Monday’s steps a bit because I forgot to put my card in my camera on Monday. As a result I couldn’t take any pictures. That is why Monday’s blog came out a bit late. As long as I was in the neighborhood I figured I would stop in a few places I had seen before, no sense wasting time. It was a good decision. The awning out front just says Bill’s but that is because the larger banner proclaiming “Bill’s Gay Nineties” Apparently the support for the banner broke and they took it down and never replaced it, not because people might have though it was a gay bar. 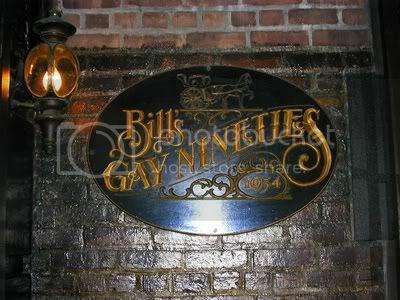 Interestingly, the Gay Nineties bar in Minneapolis where Bar Man grew up (the city, not the bar) is a well-known gay bar. But I digress. 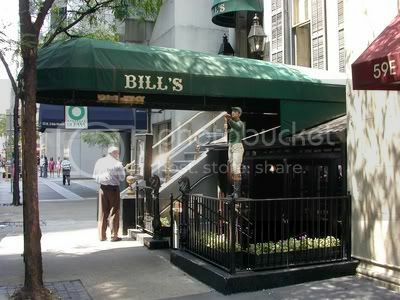 You can find Bill’s at 57 East 54th Street. 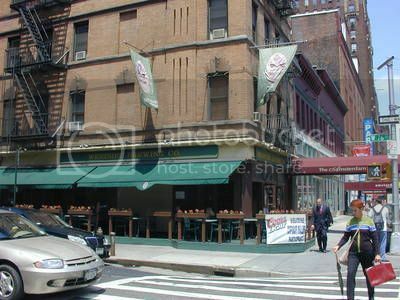 As it stands now, only a plain green awning with Billy’s written on it in white identifies this fairly small (at first appearances) place that is down several steps from street-level. It definitely has the feel of a speakeasy and, as I came to find out, for good reason. There is an old dark-wood bar complete with a foot rest a bit too narrow to be comfortable. But that would be the only complaint about this place. Old wood shelves behind the bar hold little bottles of soda (this is another place that makes your drinks with the mix poured out of bottles) and glasses. Above these shelves are mirrors built into ornately carved cabinetry sporting carved scowling faces on the columns separating the mirrors. In front of the mirrors are tiered shelves holding the liquor. The place is filled with pictures of prize fighters, and baseball players. One section of the was has pictures of the 1893 World’s Columbian Exposition held in Chicago. This was to commemorate the 400th anniversary of the discovery of America by, who else, Christopher Columbus. The lighting in here both hanging from the mirrors behind the bar and overhead, are converted gas-lights that now hold dim orange light bulbs. Tables with blue checked tablecloths line the wall behind the bar chairs and classic looking swinging doors separate this bar area from an upstairs dining area. There is also a bar on the third floor and I am most certainly going to make a return trip, probably with the Mysterious Chinese Woman in tow, to explore it. Supposedly it is made from a fireplace that was purchased from one of John D. Rockefeller’s homes, although it may have come from the old Delmonico’s.. The upstairs dining area is filled with old theater posters and programs. You gain entrance to the stairway through a pair of swinging doors topped with stained glass panels. I chatted a bit with Rich, the bartender, and Barbara, the owner. The were most engaging and most gracious. Really made me feel at home. Now maybe one of the reasons I felt so comfortable there is that back in old days the bar man’s name was Dan. Hmm, anyone believe in reincarnation. As regular readers of my blog know, I am Dan the Bar Man. Rich told me his theory about the origin of the term 86 to mean being kicked out of a place after dismissing my theory about it having to do with Chumley’s. He said it was because back when America was still a British colony, meeting of colonists was limited to no more than 85 people. When the 86th person showed up they were denied entrance. This is as good a theory as any and I certainly wasn’t about to argue with Rich. If you meet him you will understand why. Suffice it to say I had a wonderful time here and will be back again. I strongly encourage anyone who is able to visit this place for a touch of nostalgia, a very decent drink, good conversation, and a good time in general. I had a Dewar’s and soda with the soda poured from a little bottle. Just down the street a bit at 131 East 54th Street is this place that, from the outside, looks like it could be an office of some type. It is, in fact, a highly regarded steak house with a very nice bar up-front. 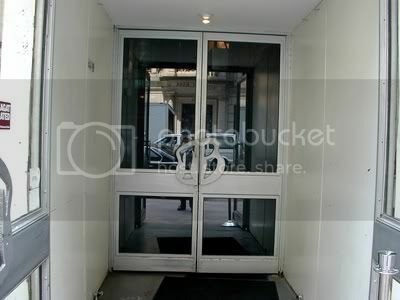 You enter at street level but then walk down a few steps to the bar. The bar is fairly small but a nice, dark wooden affair with a brass rail. There was a large and very aromatic bouquet of flowers sitting on the end of the bar where I sat. This place has mostly wood paneled walls. There is a large light fixture with 15 alabaster shades hanging from the ceiling. The bar stools are square and sit on a tan tiled area of the floor immediately in front of the bar. The rest of the flooring is wood. There are wood cabinets behind the bar with a large mirror with a bulls head mounted on it and shelves that hold an ample liquor selection with lots of wine racks, wine seeming to be a big thing here as you might expect in a steak house. 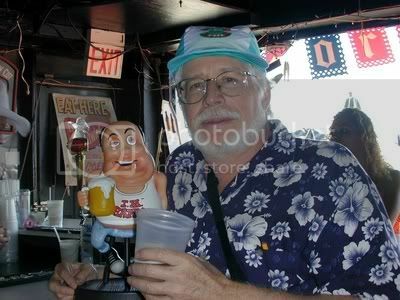 In fact I sat next to a salesman who was sharing tastes with the bartender, but not the Bar Man. He was eating a very nice looking steak but I couldn’t smell it because everything smelled like flowers to me. A partition with glass windows separate the bar area from the dining area in back that looked to be doing a decent luncheon business. 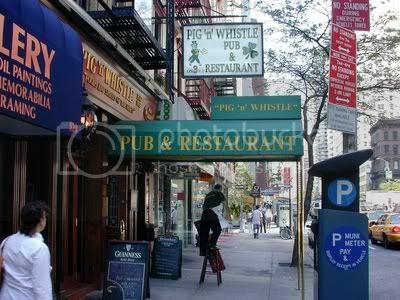 This Pig ‘n’ Whistle is located at 922 Third Avenue between 55th and 56th. It looks to be an older version of the Pig ‘n’ Whistle that I went to before, obviously the same owners because the same dapper pig is in evidence. This place is quite ornate, from the ceiling of light wood lattice work framing painted Celtic designs to the alabaster lamps hanging above the bar and from the ceiling. There are also three nice pinkish light fixtures hanging from the ceiling up front by the entrance. Two booths with frosted glass partitions also sit up front and little tables line the brick wall behind the bar chairs. Mirrors and pictures of old Ireland hang on the wall along with a blackboard advertising what appears to be their house band; pie boys flat. A row of high round topped tables with stools runs down the center of the place. There is a nice wooden bar with a foot rail. The front of the bar has an interesting ridged effect. Wood cabinets, mirrors, and glass shelves for liquor behind the bar along with more posters for pie boys flat taped over decorative stained glass panels. There are three televisions, a large one in the middle showing CNBC flanked by two smaller ones showing a soccer game between Argentina and Germany. The score was tied 1 to 1. Is it just me, or do soccer games almost always seem to be tied. Mirrors against the back wall advertise Martin’s Worcester Sauce and McGuire’s Groceries, which also sold spirits and tobaccos. All the necessities of life in one place. I had a draft 20 ounce pint of Newcastle Brown Ale and headed home. Another three for the day bringing my year to date total to 577 with 423 left to go. I set out today to check out Typhoon to see if it was still a brewery. This was to follow-up on the Daily News article about breweries in New York. Don't be fooled by the TB on the door handles. This is no longer Typhoon Brewery. It is now just Typhoon. The bar itself looks like it is cherry wood with a narrow silver bar rail supported by hefty looking black metal strips bolted to the front. Wooden bar chairs with metal backs are fairly comfortable but don’t look too welcoming. Behind the bar is a combination of coolers with metal doors and liquor cabinets with doors that match the bar. The wall behind the bar is old brick and adds to the brewery look of the place. There a couple of nicely framed mirrors behind the bar and tiered shelves holding the liquor. I chatted with the bartender who had just recently moved to New York from Tucson. He was telling me about the Nimbus Brewing Company there that is also a brew pub. Sounds like a neat enough place. 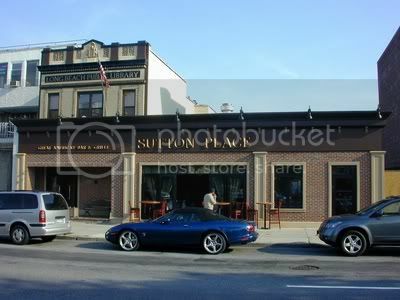 It really is a shame that there are not more brew pubs in New York. I guess the cost is just to prohibitive. I had a Raspberry Wheat beer that was very tasty, even if not made on the premises. I will be visiting the Chelsea Brewing Company one day in the near future. 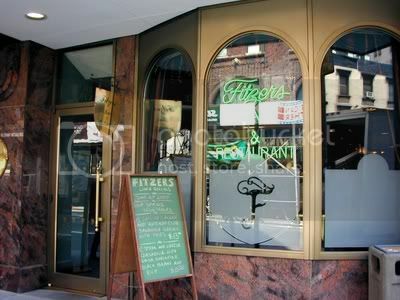 This is the bar associated with the Fitzpatrick Hotel at 687 Lexington Avenue, between 56th and 57th Street. 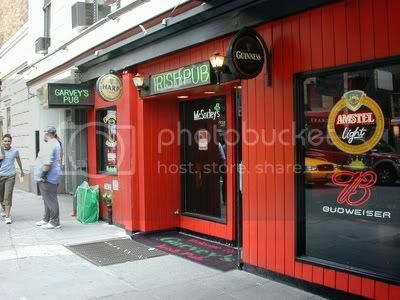 Not unlike Garvey’s, this bar can easily stand on its own and a convivial Irish pub. The bar is an old wood L shaped affair with brass rails top and bottom for feet and arms. Wooden bar chairs have maroon cloth seats. If you sit at the end next to the window you can hear the subway rumbling below your feet when it passes by. A fairly standard behind the bar set up with an old guitar and a blurry inscription hanging next to the cappuccino machine. The guitar once belonged to Brendan Grace, an Irish comedian and singer whom I had never heard of before. On the other hand, just to the left of that was a large autographed picture of The Chieftains, and they I did know. On another wall was the familiar poster featuring twelve famous Irish writers and another one featuring pictures of New York Irish pubs. Go to enough of them and you will see this one many times as well. Quite a fancy place in a well worn way. Once, many years ago, I went to a wedding that was held in the back dinning area. Alas, the bar has lasted longer than the marriage. The walls are a pale green with a band of maroon about two feet high at the bottom and then an ornately patterned wood band on top of that. In the front the floor around immediately around the bar is made up of small dark turquoise tiles with the rest of it being nice old wood. 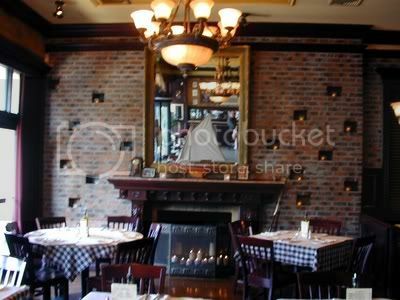 The dining area in the back is very nice with chandeliers, tan wall paper, framed paintings of Irish towns and landscapes. Quite elegant. 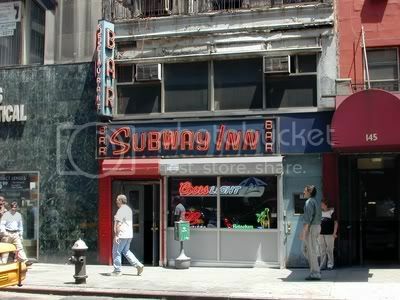 A good name for a bar that sits right next to the 59th Street subway stop on Lexington Avenue and 60th Street. It is a bit of an anomaly in this neighborhood because most places are a bit more plush. It is right across from Bloomingdales. Benny Goodman was blaring on the jukebox when I walked in, not your usual dive bar fare. This place has a dark wooden bar with a brass rail and tubular bar stools with black vinyl seats that had seen much better days. There was old wooden cabinetry behind the bar with mirrors and shelves for glasses and liquor. Several pictures of Marilyn Monroe were prominently displayed high on the wall just below the dark brown ceiling. The walls were painted in dark red and the paint was peeling in a way that only very old paint can peel. The floor is black and white tiles or linoleum. There is all kinds of stuff sitting on a shelf above the mirrors behind the bar. This included a couple of toy Godzillas, one wearing a red and white tie, model sailing ships, a ruby high-heeled shoe, carved wooden sailors…, the place looks a bit like Bar Man’s apartment. The lighting in here is provided by red globe lamps mounted on the walls and hanging under two wooden fans. There are also little booths lining the walls behind the bar stools and mounted on the wall above each of the tables is a small red florescent light. A gauzy red curtain covers most of the one window so the place has a suitable darkness to it. If you are in the neighborhood this is the bar to duck into. I had a Dewar’s and soda and the soda was poured fresh from a little bottle. You don’t see that even in most fancy places. Usually they just squirt it out of a nozzle. Well a decent enough day, hitting three bars and making the total for the year to 574 leaving me with 426 to go. There is an article in today's New York Daily News on page 28 that discusses a New York Brewery Tour. Interestingly, they mention Heartland Brewery prominently in the article. As many of you may know, Heartland no longer brews its own beer. It is now brewed at the Greenpoint Beer Works in Brooklyn. The brewmaster there, Kelly Taylor, used to work for Heartland. Greenpoint is also a contract brewer of Rheingold. For some reason Greenpoint Beer Works is not mentioned in the article at all. Bar Man thinks an "I Love NY Beer" guide to state breweries is a great idea, but I hope they get their breweries right. My earlier posted information about the Typhoon Brewery was incorrect. For about the last year the Chelsea Brewery has been making their beer. Mea Culpa. I swung by to check it out and all of the brewing equipment has been removed as well. Not being a father myself I decided to treat my self to a bit of a Father's Day celebration by doing what Bar Man does best, hitting a couple of bars. 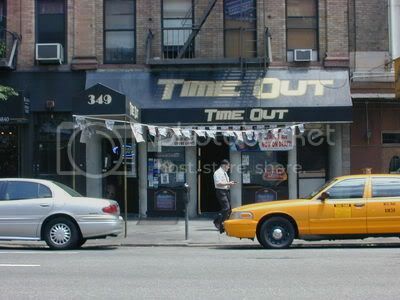 This bar is located at 279 West 45th Street on the corner of Eighth Avenue. It is actually associated with Milford Plaza Hotel but you can get into it through a separate entrance and it doesn’t in any way have a hotel bar feel to it. It is a very red bar, from the exterior to interior, all the to the red felt covered pool table. The lights throughout have green glass shades. A pleasant enough ambience and the bartenders were very friendly. They have quite a selection of draft beers, eighteen I believe. The bar has a nice copper front and top and there are pictures of horses and framed playbills on the walls. It seems to be a very comfortable place to hang out and hang out I did. I met a fellow from Atlanta named Chris Renaldo who is a fan of my blog. He was in town to participate in a triathlon and then go to a family father’s day celebration. 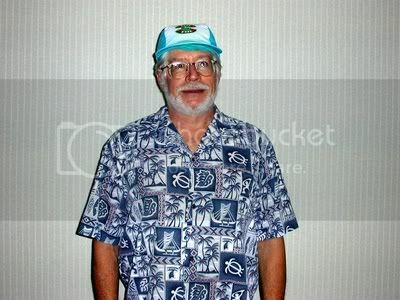 He found time to stop by and meet me and present me with this nifty Hawaiian shirt from his extensive collection. Either he realized how much I like these types of shirts based upon what I usually wear or he felt I needed to upgrade my wardrobe. Either way, the gift was much appreciated, Thanks again Chris. I had a Brooklyn Lager and a shot of Jameson’s. 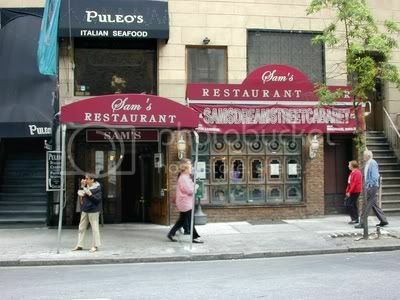 Sam’s is right in the heart of the Theatre District at 263 West 45th Street and is quite the place. Most accommodating, in fact I managed to get the friendly bartender Christine to write the review. This will probably be appreciated by some of my “fans” in Hong Kong who think my writing leaves a lot to be desired. Christine doing my work for me. Charming and cozy bar, cabaret, and restaurant with a friendly staff of performers closely resembling, possibly, your own dysfunctional family. 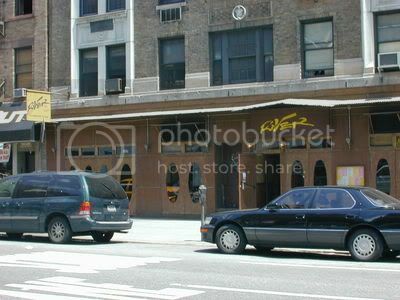 It has a very comfortable feel right in the heart of New York City’s theatre district. Exposed brick walls with the original lighting fixtures and ceiling. This old fashioned establishment offers a combination of New York traditional and cool modern flair. The food is excellent, made fresh. Simple Italian and American menu, great pasta and the best hamburgers. The staff is made up of a cast of quirky characters and performers ranging from stage actors, musicians, and country singers who make you feel like you are a part of Sam’s family. There is live music during dinner and open mic cabaret performances. I was there during brunch and the piano playing and singing was quite good. It caught me a bit by surprise when the bartender, Christine, walked to the next room and started singing. The dining room is separated from the bar area by a wall with open windows and a window like mirror. Makes it a bit confusing, after a drink or two, trying to figure out if you are looking into the next room or at the people sitting next to you at the bar. I had a Maker’s Mark Manhattan, two actually, and one of Christine’s specialties, an Orange-A Tini. This was a surprisingly refreshing and tasty drink. I lingered here a bit, while actually a lot, longer than I should have because everyone was so friendly. That was two bars for the day bringing my total to date to 571 leaving 429 left to go.